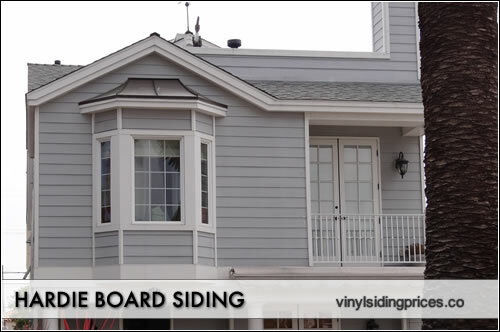 Hardie board siding prices range from $5 to $10 per square foot with installation. This price includes the cost of the product itself, additional materials such as trim and fascia board and the installation or labor portion on the project. Hardie Board is arguably the most popular fiber cement siding on the market that is manufactured by James Hardie Siding Corporation. The boards themselves range in price from $1 to $2.50 psf (per square foot) depending on length of board, style or product, as well as whether they are factory primed and/or painted. The boards are typically sold as 8'or 12' panels that average out to this psf price. Most homeowners aren't purchasing the product themselves, instead relying on the contractor to buy all of the materials for the project - which usually works out to the same price a consumer would pay at a home improvement store but the contractor typically delivers the product to the job site. Similar products include WeatherBoards - see more on Certainteed siding costs. Additional materials are necessary for most replacement siding projects to adequately protect the home from long term moisture damage and to create a visually appealing exterior. Additional materials include housewrap, nails, soffit, fascia, trim, starting courses, mounting blocks, etc. Installation prices range anywhere from $2 to $6 psf. There are tons of factors that will affect whether you pay at the low end or the upper end of this price range. Some of the bigger factors include whether the existing siding needs to be removed, how big or small the project is, the number of cuts that need to be made for windows and doors, as well as how much trim, soffit and fascia work is needed. Entry level project totals range from $5 to $6 psf installed. This includes the hardie board panels, all additional material costs and the cost of installation.For more pricing information, try our Hardie siding calculator. Mid range project totals range from $6 to $8 psf installed. This includes the hardiplank panels, all additional material costs and the cost of installation. Browse Hardiplank colors here. high end project totals range from $10 to $10 psf installed. This includes the hardieboard panels, all additional material costs and the cost of installation. DIY project. Price is for materials only. DIY project. The homeowner had additional costs for specialized tools and hired out the labor on an hourly basis. Includes contractor installation. The project also included whole house painting, exterior work on shutters, trim, moulding and repair to existing window frames.